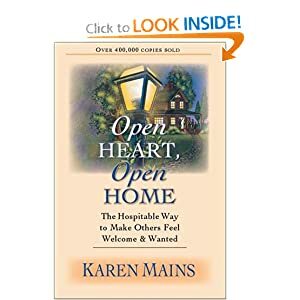 I recently finished reading Open Heart, Open Home by Karen Mains. This book caught my attention because if you have been following this blog, you probably know that I have purposed in my heart to work on hospitality. I will share some specific things that I found to be especially thought-provoking from my reading. And, hopefully whether you're someone like me who has to try.really.hard at hospitality in my home (mostly for dinners and big groups I struggle) or if you're someone that entertaining comes as natural to you as breathing, I hope you can take something away from this. Regardless, "for all (entertaining) must be nurtured." When speaking of her own home, Karen said, "It was a modest home but it served the kingdom well." So, no matter how big or small our home is, no matter how well (or not so well) it is decorated, is of no consequence. If we give our homes to God He can use them no matter what. "True hopsitality comes before pride. It has nothing to do with impressing people, but everything to do with making them feel welcome and wanted." I once heard the quote, "If you're stopping over to see me, come any time. If you're stopping over to see my house, make an appointment!" This helps take some of the self-inflicted pressure off myself when I have a friend over. The point is to fellowship with each other, not have my guest do a "white glove" test of my house! "Essential to hospitality is that the open heart results in the open house. These two elements--an open heart and an open home--are potential in every Christian, male or female, married or single. Each has a heart the Spirit is seeking to move with the things that move the heart of God. Each has a home--be it a small room, a modest flat, or a mansion--in which we can practice hospitality." Basically she also says that secular entertaining is about impressing others while hospitality is about serving others. "Entertaining always puts things before people. Hospitality...puts people before things." One of the most encouraging thoughts I came away from this book was that hospitality can look different than just opening up your home and having people over for dinner. Hospitality can be shown by taking homemade bread to someone who is ill, taking a meal to a new mom or someone who had surgery, "steadying the arm of that elderly person in the midst of jostling crowds...comforting that...child in the store whose 'Mommy got lost', listening to the middle-aged woman who insists on talking during the entire train trip" and so much more. "This created world is a vast hostel in which we can practice hospitality and courtesy and openness." Finally, she deals briefly with overcoming limitations to hospitality such as finances, space and self-imposed limitations and then suggests creative alternatives. So, that gives you a peak into the book. I found it to be helpful in spurring me on this area of my life. Also, read Isaiah 58:6-9 & Luke 14: 12-14.
i love this view of hospitality, and how it extends beyond the home. speaking of which, my motto for home is: it's not about how your home looks, it's about how it feels! I am blogging through this book and posting a linky on it each week. I know this is a slightly older post, but I'd love it if you'd join in and link up (you can link your older posts) in the discussion.